Its not too late to get tickets for this fantastic evening of music. 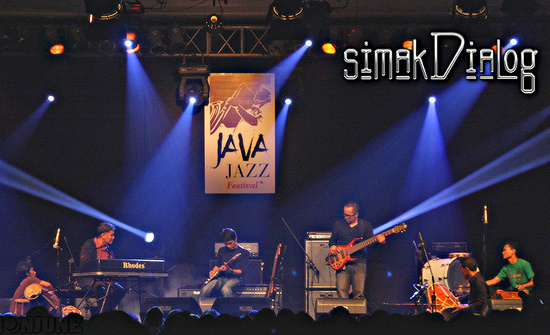 The internationally-renowned, critically-acclaimed progressive jazz ensemble, simakDialog, has been crafting their unique amalgam of modern progressive jazz, psychedelia, avant garde, fusion, world music and native musical dialects for over 20 years. Founded in 1993, in Jakarta, Indonesia, and led by the brilliant keyboardist and composer, Riza Arshad, the group has reached a jazz “cult” status, of sorts, in a country known throughout the centuries for its rich cultural and artistic heritage. Augmented by the world-class guitar stylings of Tohpati (a band leader and MoonJune Records recording artist, himself), the fabulous bass work of well-known and -respected veteran Adhithya Pratama, and the intricate, interwoven rhythmic layers of three superb percussionists — Endang Ramdan, Erlan Suwardana, and newest member, Cucu Kurnia — simakDialog are a band that has continued to steam through uncharted waters since their inception. Their five albums (with a forthcoming sixth on the very near horizon!) reflect a continued progression of music that looks and reaches to the future, while being highly cognizant of the immediate present, yet still reverencing musical traditions which date back thousands of years. The simakDialog is a musical conversation, every bit as unpredictable as it is captivating and enthralling. The sensitive, artful approach they employ has earned them prestigious music awards in Indonesia, and, more recently, recognition and accolades on a much larger platform. Arshad’s keyboards and writing are phenomenal: frequently reminding listeners of a number of progressive jazz’s most innovative and revered players. The influence of storied, legendary icons from its more formative years (names such as Zawinul, Corea and Mays spring to mind) is visible, while the work still reflects his profoundly original and contemporary signature qualities. Tohpati’s extragant, ever-searching fretboard excursions provide, alternatively, the perfect compliment, departure or contrast to Riza’s silky chording. Despite his decidedly adventurous approach, the unpretentious guitar work of Tohpati is never anything less than highly-polished, brilliant and confidently enunciated. Both featured players draw from respective tonal palettes that are superb. Arshad’s keys are always buoyant, yet warm and ever respectful of the moment. His Fender Rhodes sounds are creamy and elegant, as good as it gets, while Tohpati routinely reminds listeners of the appetite and voracity of a Hendrix, McLaughlin, Rypdal or Fripp, with equally-compelling, -robust guitar voicings. The two contrasting sounds and styles often serve to create enthralling musical tensions, producing progressive music that is brimming with intrigue and powered by genius in its most fertive, spontaneous state. The band are propelled by an unusual drivetrain, without the presence of a conventional drummer. This does not hamper proceedings in the least, as their three percussionists function with the poise, grace and perfect sychronization of a lavish, precision Swiss timepiece. simakDialog are eccentric: having an understanding and fluency in native cultural music forms (with gamelan, perhaps the most noteable influence), yet profoundly articulate on a more far-reaching scale — enunciating with strength and conviction, on whatever musical ground they care to tread. With a mastery of diverse stylings and an expansive range of influences from which they draw inspiration, their work presents itself as an exotic, intoxicating and tantalizingly-quirky musical blend. Echoes of towering progressive jazz pillars, such as Weather Report, Pat Metheny Group and early incarnations of Chick Corea’s Return To Forever, effortlessly dance before your ears. Conversely, to call their music “psychodelic” would be, in a sense, almost demeaning or doing them a disservice. While exhibiting certain characteristics and a discernable influence, it is quickly apparent that simakDialog possess the musical diction, prowess and ambitions which easily distance them from typical contemporary bands of the idiom. For many afficiandos, this fearless, aggressive mentality accurately symbolizes the very nature and essence of modern jazz. … And simakDialog’s body of work evidences this quality — in a rudementary sense — as they continue their voyage of discovery, continually venturing through amazing, previously-uncharted sonic territories with each successive album. 2007 marked the band’s international debut, on MoonJune Records, with the release of the well-received and highly-regarded Patahan (MJR015). The album and its follow-up — 2009’s resplendent effort, Demi Masa — prompted enthusiastic reviews in more than 25 countries and allured legions of appreciative new listeners from around the globe. Armed with an eclipsing progressive vision and coupled with an unquenchable thirst for fresh, new musical sojourns, simakDialog continue to win over new fans around the globe. Their work remains as vibrant as it does unpredictable. Refusing to be stereotyped — even after twenty years — the Indonesian progressive giants continue to boldly go where no one has gone before. Currently, simakDialog is set to release their long-awaited sixth album (and third for MoonJune Records) in the late summer-early fall of this year (2013). Having performed previously in Indonesia, Singapore, Malaysia, Nepal, Germany, and The Netherlands, the band is eager to bring their stirring musical performance to their growing audiences scattered across the Western Hemisphere. These are true progressive pioneers, parlaying brave, new music of the highest order as their just rewards. In spite of their corporate success, they remain very kind, humble individuals. Their stirring, magical music is truly deserving of such broader audiences. 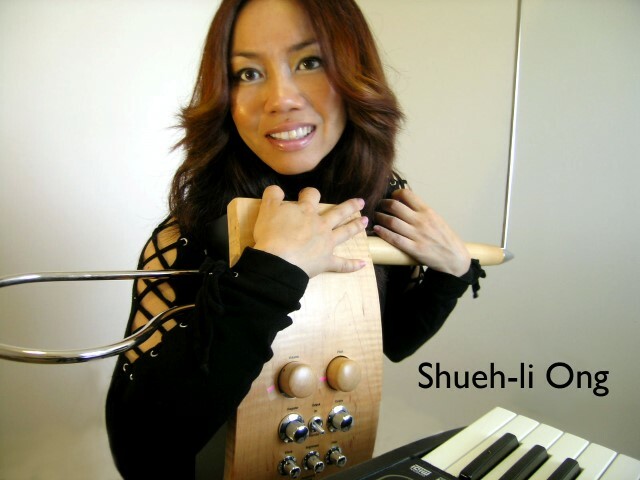 What one immediately notices on listening to Shueh-li is her distinctive use of the ethereal theremin, plucky guqin, exotic synth hooks, rustic tin-whistle and rich vocal harmonies. One wonders thereafter; why the theremin? Shueh-li was a student of electronic music while studying classical piano at the Elder Conservatorium in Australia (her birthplace), with interactive multimedia techniques as her area of research. As one observes her petite frame flit from stitching the theremin into a beat pattern, slipping in a synth bass to bolster softsynth designs, producing sometimes poignant lyrics, other times a luscious instrumental, one realizes that her desire to embrace her foreign expressions is the central theme. Xenovibes (foreign expressions; Austral+Asia, classical +electronic) became her flagship show band which premiered in Singapore to a standing-room-only crowd. She made her US debut at the Dallas Museum of Art a year later in 2005, to an audience of 4,380. In 2010 Shueh-li relocated from Dallas to Nashville to write her debut solo album A Working TItle – special edition, released August 2012. Since she began her journey, Shueh-li has been the 1st thereminist at various events, and worked with &/ or recorded such artists as Dean Parks (Steely Dan), Mike McKinney (Jackson 5) & Curtis Randall (LeAnne Rimes). But Shueh-li (pronounced Shelley) still has places to go; she wants to offer her music to the world. Singapore‘s Diva of the Theremin and MoogMusic endorsed artist, continues to write and perform as long as she is inspired. Though she is often spoken of in the vein of Kate Bush, Janet Jackson and Ryuichi Sakamoto, Shueh-li stands out as her own production! “An inspired artist who has brought fresh ideas in the theremin field.” said ThereminVox of Italy. “A truly amazing talent!” Arts Monthly Australia. Electronic Musician magazine covered her studio techniques in a full-page article “No Barriers”.